*Take small surveys on the products you receive and give your friends your referral link for Ipsy points. Trade in the points for bonus items. Initial Thoughts: Conflicted. The bareMinerals lip gloss makes me VERY happy. So does the BB Cream. I have never heard of this brand, but I have a slight obsession with trying all the different BB Creams on the market. I promised myself I will only spend money on Smashbox BB Cream (it's the best...by far). So, my beauty boxes are the only way I get to try other brands. I am very intrigued by the eye patches. I've never used any before and I am excited to try them out. The eyeshadow quad is a bit of a let down. I love the colors, but the eyeshadow is horrible. I don't know how they charge $16 for this crap. It has very little pigment and it does not last. I rubbed it on my hand and it rubbed away completely with little effort. Since this was the most expensive thing in my bag, I am really bummed that I don't like it. Initial Thoughts: Honestly, this box looked pretty empty when I opened it. I was a little disappointed in the size of the samples. I was excited though when I started looking closer and seeing what I had. I ADORE Alterna products. Sample Society has sent me three of them now and every single one is amazing. I will also use the two facial masks. The Clark's Botanicals one can also be used as a moisturizer which is cool. I won't use the Tantasia at all. I am a pale white girl that doesn't like fake tanner since it almost always looks streaky and/or orange. The Jane Train hair accessories are cute and I will probably use them. Overall, a decent box. This month's winner: Sample Society. 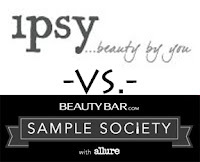 Neither box really impressed me, but Sample Society had more products I was happy to try and will use. Do you get sample boxes? What did you get? I've been interested in getting one of these subscription boxes, so I liked reading about what you get! Thanks for the insight! Good information! I, too have been interested in the boxes. I'm so paranoid I'll get scammed!